The Adirondack High Peaks is the name given to 46 mountain peaks in the Adirondack Mountains of New York, United States that were originally believed to comprise all of the Adirondack peaks higher than 4,000 feet (1,219 m). However, later surveying showed that four of the peaks in the group are actually under this elevation, and one additional peak that is close to this elevation had been overlooked. Due to tradition, no mountains were removed from or added to the group as a result of the revised elevation estimates. All except four are located in central and northern Essex County, primarily south of Lake Placid and Keene Valley. The others are just to the west in Franklin County. All the summits are on land owned by New York State as part of its Forest Preserve. Forty-two are in a vast tract of nearly 300,000 acres (1,200 km2) known as the High Peaks Wilderness Area, subdivided into central (26 peaks) and outer (16 peaks) zones. Nine of the peaks in the outer zone are in an area formerly known as the Dix Mountain Wilderness Area that was added to the High Peaks Wilderness in 2018. Giant Mountain and Rocky Peak Ridge are in the adjacent Giant Mountain Wilderness Area. Whiteface Mountain, which has a downhill ski area and a toll road to its summit, and Esther Mountain are set slightly to the north, in Wilmington. Those who have climbed all 46 High Peaks are eligible to join the Adirondack Forty-Sixers club. Neither Mount Marcy nor Algonquin Peak, the two highest, require technical skills, but Algonquin Peak is regarded as the more challenging climb. Twenty peaks have no official trail to the top, although rough informal routes, commonly referred to as "herd paths," have developed over the years and no true bushwhacking is required on any of the peaks, although some are still quite primitive. Atop the highest peaks, above the tree line, there is a total of 87 acres (35 ha) of extraordinarily fragile alpine ecosystem; the amount of this ecosystem is constantly changing due to variation in the climate from year to year. The region contains many alpine lakes and meadows, wetlands, streams, and forests. 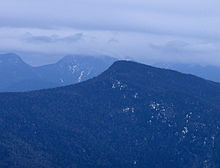 The Eastern High Peaks Wilderness area is the most regulated area. Fires are not permitted; dogs must be leashed; overnight groups are limited to eight people and day groups to 15; and bear-resistant food canisters are required from April through November. Some surveys list MacNaughton Mountain at 4,000 feet (1,219 m), and some argue that it should be included in the High Peaks. However, more recent surveys list the mountain at 3,983 feet (1,214 m). ^ "Hiking Challenges: The Adirondack 46ers". Adirondack.net. Retrieved 8 June 2017. ^ "High Peaks Wilderness Area Unit Management Plan". New York State Department of Environmental Conservation. Retrieved 2 August 2018. ^ "How to Join". ADk 46ers. Retrieved October 31, 2016. ^ "MacNaughton Mountain". Geographic Names Information System. United States Geological Survey. Retrieved 2012-12-20.